Florida, with its fragile natural beauty and burgeoning population, has been called a bellwether state. The state’s past and future management choices in balancing environmentalism, development, and commerce will be studied around the world. As Tampa Bay developed in the mid-century, environmental planning lagged behind the boom of growth, and the Bay’s water quality became abysmal. With the enactment of the Clean Water Act in the early 1970s, the community recognized that attaining the goals of fishable, swimmable, and drinkable water was essential to quality of life. The Bay Study Group was created by the City of Tampa in 1976 to assess the biological conditions of Hillsborough Bay. Over the next three decades, it monitored the effects of pollution abatement that resulted from the city’s upgrading of its wastewater treatment plant from primary to advanced treatment. The Bay Study Group was one of several entities working to ameliorate the effects of population and industrial growth on the environment. In collaboration with Associate Professor Ann Hodgson, Special Collections is actively collecting materials documenting the efforts of scientists, government officials, and concerned citizens to clean up Tampa Bay, which had become extremely polluted by the late 1960s. The Tampa Bay Environmental Collections are extraordinarily relevant to coastal communities around the world as a case study and a model for ‘lessons learned’ in the conservation of estuarine quality and ecological services. The values and functions provided by a healthy estuary are virtually unlimited, involving a suite of biological and human dimensions categories. The development of coastal communities is linked to ensuring the inhabitants protect a freely available supply of high quality water resources. Communities rely on water as the foundation of their lifestyle, and to ensure their way of livelihood. For coastal communities, ecological services involve aspects such as fisheries production, unpolluted water for residential, agricultural, and industrial uses, recreational opportunities, and visual and olfactory aesthetic appeal. When one considers the economic impact of tourism and recreation in the area, only a healthy Tampa Bay can ensure a healthy economy. Underpinning the Tampa Bay Environmental Collections are the papers and reports of the Bay Study Group (BSG), which document the remarkable restoration of water quality and biological functioning in Hillsborough Bay that began in the mid-1980s. In addition to written reports and data, the BSG has donated its photos of monthly aerial flyovers of the bay to assess its health as an ecosystem. Equally important, George S. “Skip” Gandy IV, the leading aerial photographer in central Florida from the 1960s through 2005, donated to the Libraries his collection of over 500,000 negatives showing the development of the Tampa Bay area. Skip Gandy conducted aerial and commercial photography for many prominent local companies and recorded the region’s industrial, economic, and urban growth over several decades. The collection also includes photographs from his father George S. Gandy III, the noted photographer for the St. Petersburg Times through the 1960s. These photographs richly document the regional environmental changes from the time when Tampa Bay was at its most significant environmental downturn to the era of the present day restoration story. Before any other environmental groups took an interest in Florida, volunteers from the Audubon Society were appointed as game wardens in the late 1800s to protect the state’s population of birds, which were being aggressively hunted for their feathers as accessories to women’s hats. Audubon Florida has graciously donated the daily logs and reports of these wardens and other appointees to Special Collections. With an emphasis on Tampa Bay, Lake Okeechobee, and the Florida Keys, these records provide an intimate view into the sometimes dangerous and often thankless work of a game warden. 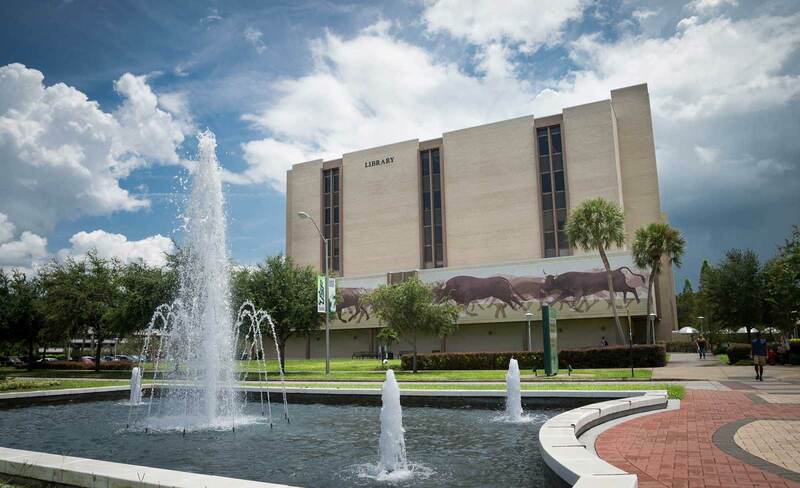 Description: Special Collections is honored to house the papers of Roy R. “Robin” Lewis III, a key scientist and activist in Tampa Bay’s recovery. Lewis’ expertise includes the ecology, management, restoration and creation of fresh and saltwater marshes, mangrove forests, forested freshwater forests, and seagrass meadows. He has studied the effects of oil spills on coastal ecosystems, plant and animal colonization of dredged material islands, marine and estuarine fish use of restored tidal wetlands, and experimental revegetation of wetlands using both marine and freshwater species. He has published more than 100 papers on these subjects, and is the editor of Creation and Restoration of Coastal Plant Communities, published by CRC Press in 1982. Description: Many prominent water scientists with decades’ experience in the science and politics of ecology are retiring from active employment in Florida. The state’s historical memory will be vastly enriched if their stories and knowledge are preserved. Generously funded by the Tampa Electric Company, this oral history project will pair the memories of the bay’s most important stewards with the written sources collected by the library. Beyond offering an invaluable resource on its own, the TBEOHP will provide vital context and background for existing resources pertaining to the environmental quality of Tampa Bay. The contextualization of this information and its global access provide scholars and community leaders access to an unparalleled resources and knowledge of a success story that directly addresses food and water security, public health, and the protection of critical natural resources. All interviews are being conducted by Dr. Ann Hodgson. Given her extensive understanding of the bay’s history and ecology, she is an ideal interviewer of other prominent scientists who promoted the restoration of water quality and ecological balance over the past several decades. Janice Kaminis Platt (Jan K. Platt) was first elected as a Tampa City Council Member from 1974-1978 before being elected to serve on the Hillsborough County Board of County Commissioners, where she held office from 1978-1994. As an active County Commissioner, Platt has fought to protect the environment, keep government honest, and assure balanced, managed growth. Concerns over Tampa Bay helped to elect Platt, and her steadfast efforts ensured continued electoral support. Her efforts in favor of growth planning, resource reclamation, and environmental stewardship ensured a close working relationship with the citizens, officials, and scientists who wanted to make a difference. Extent: This collection is not yet processed. Inspired by the first Earth Day in 1970, Frank M. Dustan decided to pursue a bachelor’s degree in biology at East Stroudsburg University in Pennsylvania. After completing his degree, Dunstan moved to the Tampa Bay area in 1973 and served as warden/biologist for the National Audubon Society’s Tampa Bay Sanctuaries’ wildlife sanctuaries until 1977. During this time, Dunstan published several articles on wetland and avian ecology and conservation. Dunstan continued his environmental work in the Northeast where he held several positions, including Urban Forestry Program Coordinator with the New York Department of Environmental Conservation and the Vice President and Director of the Sanctuary Department with the National Audubon Society.